I spent a lot of time at Charlotte barbershops last month. Not because I was obsessed with being perfectly coiffed; I was researching an article for Creative Loafing. 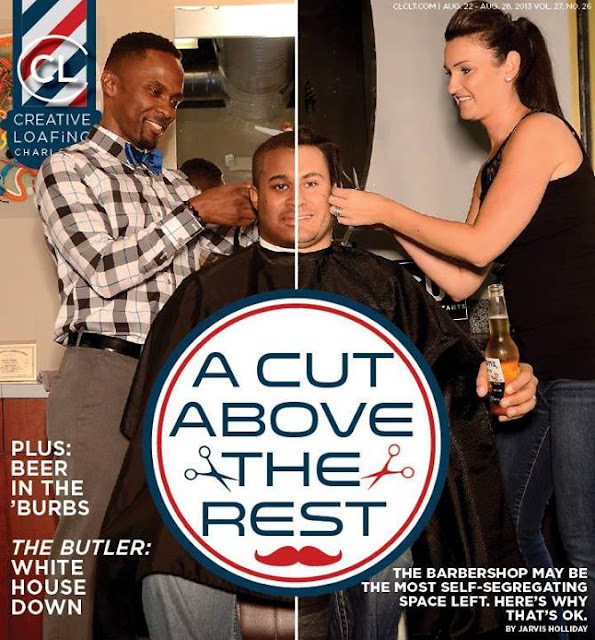 That work appears as the cover story, "Inside Charlotte's barbershop culture," for this week's paper (August 22-28), online now and on newsstands by tomorrow. As men, we've been going to barbershops regularly since we were toddlers. I have about 30 years of barbershop visits under my belt, so you would think I--and you--know all about it. But with this story, I learned a lot about how much barbershop culture has changed, while in some ways staying the same, in Charlotte. I think the story reflects the many modern options and amenities we have in a growing metropolis, but also shows the importance of tradition. Some of you prefer that old-school, no-frills barbershop, typically run by a middle-age barber and where shop talk is essential. While others like the newer, more modern shops with the fancy décor, where you can enjoy a beer while you wait, and maybe get a scalp massage or pedicure in addition to your trim. But the story cuts deeper than that: it's also about class, race, and gender. My premise is: "In 2013, where a man gets his hair cut in Charlotte says as much, if not more, about him as how he gets it cut." Check out the story, along with the accompanying video shot by ABlackTV, and see if you agree.